Not everything is bigger in Texas! Last night Plano celebrated the grand opening of MINI’s newest dealership. 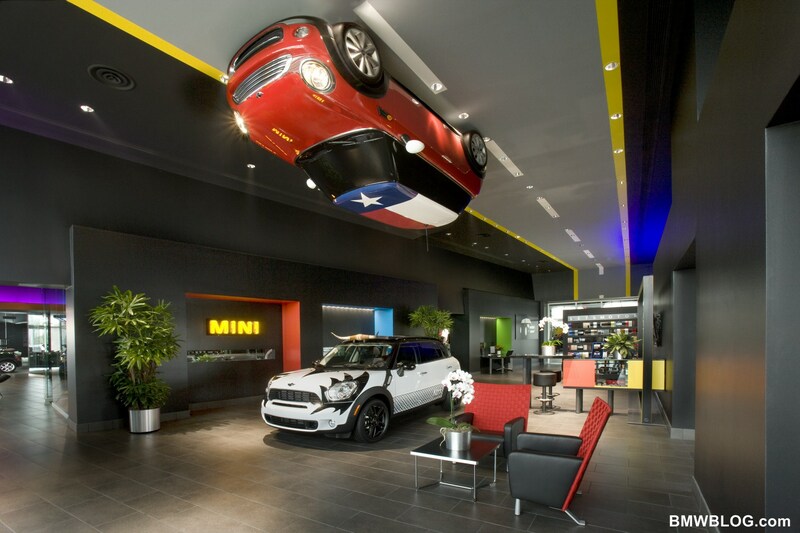 Sewell MINI of Plano is now open and features dramatic interior and exterior design, along with plenty of features for a family-friendly showroom and service experience. The 23,000 square-foot showroom and service center is not only a stunning display of architectural design, but is also specifically designed with the customer in mind to make buying and servicing a MINI more fun than ever before. An arcade-style waiting area is open for customers to either challenge each other at the X-Box station or try their skills on one of the vintage multi-game arcade machines; iPads are available for loan. For MINI customers who are just as passionate about their pets as their cars, fully stocked car wash and pet wash stations will open later this year. The interior features include a large highway mural on the ceiling, with a suspended fiberglass body of a MINI hardtop cruising over visitors’ heads. Sewell also commissioned a local artist, Wilhelmina Adams, to develop four custom paintings featuring the dealership’s mascot, “Bull,” an English bulldog. There is also a classic Mini on display in the showroom, it’s positioned going through one of the facility’s interior walls. The exterior was completed in MINI’s traditional style, with black walls and large brand logo displays. An added feature can be seen at night, when 180 feet of LED lights shine from the soffits and mimic the changing colors of MINI vehicles’ interior mood lighting. Hundreds of guests attended the store’s grand opening celebration on May 26, where they enjoyed a Battle of the Bands featuring The Spazmatics and Destroyer, a KISS cover band. Guests were treated to delicious fare from Chef Kent Rathbun, more than 61 arcade-style games and tunes spun by DJ Lucy Wrubel. In celebration of the opening, Sewell MINI of Plano is also giving away a luxurious trip for two to London, complete with a visit to the birthplace of MINI. Visit store for details and registration.